Randal is the best main character one can ever imagine: he’s kleptomaniac, a sociopath and an awful friend above all. After his friend Matt’s engagement party, waking up on a Monday morning with a massive hang over, Randal finds Matt’s wallet in his pocket. Inside the wallet, there’s that really precious engagement ring. It doesn’t take Randal much and long to sell the ring – triggering a fatal curse: Matt commits suicide, and Randal is now supposed to live through the same fateful Monday again and again, doing whatever is needed in order to fix the horrible situation. Randal must recover the one precious ring and his life, before the situation worsens… or the universe collapses. 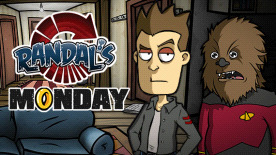 Randal’s Monday is developed by the Spanish team Nexus Game Studios, who teamed up with the adventure gaming experts at Daedalic Entertainment to prepare the world-wide release. The PC point & click adventure game is scheduled to be released in Q3 2014. 7 great chapters - gameplay time will depend on how much time you spend in front of the TV in your childhood. More than 40 different environments carefully hand crafted. More than 50 characters including repulsive mothers, retired priests and talking skulls. Jillions of references and homages to geek culture.